The Skylon Tower project was developed by W.P. Piggott of Piggott’s Construction of Hamilton, Ontario, C. Richard Reese of Hershey, Pennsylvania and William Young of the Hamilton Cotton Company, of Hamilton, Ontario. The former tallest structure in Niagara Falls cost $7 million dollars to build. It was originally known as the Niagara International Center Tower by its parent company. Property for the project was leased from Mr. George Sainovich and the New York Central Railway. The Skylon Tower, inspired by the Space Neddle tower, was designed by the architectural firm of Bregman and Hamann of Toronto, Ontario. It was built by the general contractor: Piggott’s Construction Company. On site consulting engineers were provided by H.G. Acres & Company. Mechanical and electrical engineering consultants were provided by Grenok, Chisvin & Company of Toronto. Prior to construction, wind tests were conducted by experts at the University of Toronto. Consulting structural engineers were provided by the company Farkas, Barron & Jablonsky of Toronto and New York. 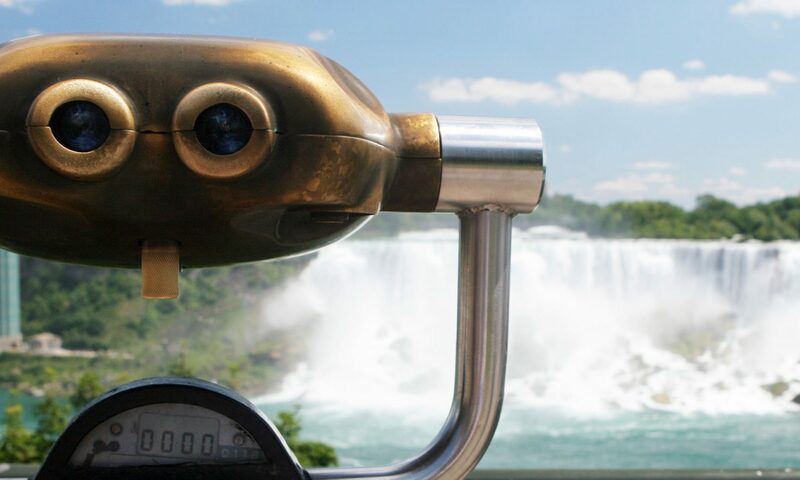 In May of 1964, construction began on the Skylon Tower measuring 158.5 metres tall on land atop the moraine and 236 metres above the base of the Falls. The tower is overlooking the Falls between Murray Street and Robinson Street in Niagara Falls, Ontario. Since it was so tall and near international borders, both the United States and Canadian Governments had to give apporval before the structure was built. The tower is designed to withstand winds up to 110 miles per hour (mph). The maximum wind recorded was 91 miles per hour (mph) even though the average wind speed is 14.5 miles per hour (mph). This tower contained a three storey globe at the top of the tower containing an indoor/outdoor observation deck, a revolving restaurant and stationary buffet restaurant. This globe according to the designer’s represented the Northern Hemisphere. At the base of this tower was a large 20 m tall – 105,000 square feet, three level exhibition complex including stores, restaurants and other entertainment. The building of the Skylon Tower represented the second time that a “slip-form” construction technique was utilized. It had been previously been used in the building of the Seagram Tower. The base of the center column measures 72.6 feet in diameter. The top of the center column measures 33.6 feet in diameter. A 35 ton Linden Crane with a 100 foot long boom was used to lift the concrete and supplies into place. This crane which cost $45,000 was able to lift 5,500 pound each time. At the end of construction, the Linden crane was removed from the top of the tower by cargo helicopter. Slip-form concrete began pouring on September 23rd 1964. Concrete was poured continuously for 38 days – twenty-four hours a day. The tower rose six inches per hour or twelve feet per day. The column contains 12,000 tons of concrete and 800 tons of steel. One of the most challenging engineering feats was the construction and placement of the Dome at the top of the shaft. The base of the Dome, 108 feet in diameter, was assembled at ground level then, was raised 380 feet in the air. The widest part of the globe at the top of this tower measures 108.8 feet in diameter. At the top of the column, this form was fastened into place by 36 – 2.5 inch diameter, 25 feet long bolts. It served as the base form of the globe. Once at the top, the globe form was reinforced with 125 tons of steel and 800 yards of concrete. The grey concrete and steel tri-legged tower supports the globe at the top. The tower has three high speed elevators which ride on the outside of the tower on rails mounted on the outside walls of the column between the three legs. This was Canada’s first outside elevator. It was designed and engineered by Otis Elevators Limited of Hamilton, Ontario. Each elevator which is capable of holding 30 people is glass enclosed to provide maximum sight lines as it ascends or descends at 500 feet per minute. The exterior of the elevator is comprised of a weather resistant plastic coating. In addition to the elevators, this tower has two separate 662 step staircases leading to the lowest level on the globe at the top of the tower. The 300 person revolving dining room makes one complete rotation every hour. The rotating floor which rests on a circular rail is propelled by a 3 horsepower motor. On October 28th 1964, the tower was officially named the “Skylon Tower”. Then company president, Edward Bull Jr., described the name as meaning “space aged version of a skyscraper”. On May 21st 1965, a fire erupted on the roof of the base of the tower. The fire was contained to a 6,000 square foot area of tarred beaver-board. Damage was estimated at $5,000 dollars. On June 12th 1965, the base form of the globe was slowly lowered at a rate of forty feet per day. This form was used by painters to paint the tower as it was lowered to the ground. On September 31st 1965, the Skylon Tower was officially opened. Canadian Pacific Hotels held the contract to operate dining facilities at three locations within the tower. On October 1st 1975, Canadian Pacific Hotels purchased the Skylon Tower complex for $11 million dollars. On August 7th 1974, the Skylon Tower and it’s owners – Canadian Pacific announced the sponsorship of the first annual Skylon Marathon between Buffalo, New York and Niagara Falls, Ontario. On June 21st 1985, two unidentified men parachuted from the top observation deck of the Skylon Tower to the ground below. On October 19th 1985, Canadian Pacific Hotels put the Skylon Tower up for sale. The sale price is $20 million dollars. The Skylon Tower was sold in 1986 to Niagara Falls businessmen, Mr. George Yerich and Mr. John Gruyich. Mr. Yerich was the owner of the Holiday Inn by the Falls Motel and Mr. Gruyich was the owner of Michael’s Inn. On June 2nd 1986, David Hicks became the 3rd person to successfully parachute from the observation deck of the tower. On December 10th 1988, Mr. George Yerich became the sole owner of the Skylon Tower complex. This tower is currently in service. During 1999, at least five persons have parachuted from the observation deck of this tower to the ground below. This illegal activity known as “Base Jumping”. Since its construction in 1964, two persons have committed suicide by jumping to their deaths from the observation deck.